If you’ve been following this blog, then you’ve heard mention of The Bike Bridge. We can’t say enough about this project, and it’s so close to becoming a reality. The City of Oakland has approved the installation of the sculpture in a new park on Telegraph Avenue, between 19th and 20th Streets, adjacent to the beautifully renovated Fox Theater. The sculpture was created by 12 young women from Oakland schools and artist Michael Christian, well known for his large-scale metal works displayed at Burning Man. 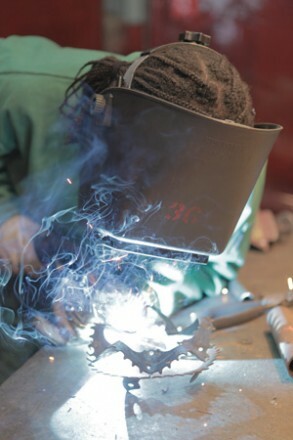 We partnered with The Crucible to teach the young women welding and art-bike creation. 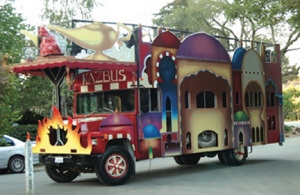 These courses imparted the skills needed to undertake the creation of a large-scale work of art. Working together, the youth designed and fabricated a sculpture using reclaimed bicycle parts. The entire process was incredibly collaborative and the results are inspiring! This is just the kind of project the BRAF staff and Board have been dreaming of, ever since the organization’s inception in 2001. Founded by several of the partners who produce Burning Man, an annual arts event in the Nevada desert, BRAF was established to share the benefits of interactive, community-driven art projects with the rest of the world. At Burning Man, we’ve seen how participatory art experiences can build community. Collaborative art projects encourage cooperation, dialog, negotiation and exchange of ideas. The artworks created are far more than the sum of their collaborators’ inspirations. When many creative minds work together, the potential of public art expands, both in form and in function. A public art piece can be more than a static representation of one artist’s vision. When approached collaboratively, the creation of a work of art engenders meaningful connections between individuals, bringing them together in the spirit of creativity, wonder and community pride, thereby strengthening the community as a whole. The Bike Bridge demonstrates these values in a new, exciting format. This educational and creative project is designed specifically to engage Oakland’s youth, providing them with a fun, empowering new means of self-expression. We’re so close to making The Bike Bridge a reality. To fully fund this project we need to hit our goal of $20,000. Make a pledge to the project’s new Kickstarter campaign and get cool special gifts! Every dollar helps! Why give to BRAF’s Kickstarter campaign?